I am using PaleMoon for weeks now since FF Quantum pushed me away from FF. I had no issues up to now. Some plugins do not work, but i do not feel this a problem, as there are enough alternatives. 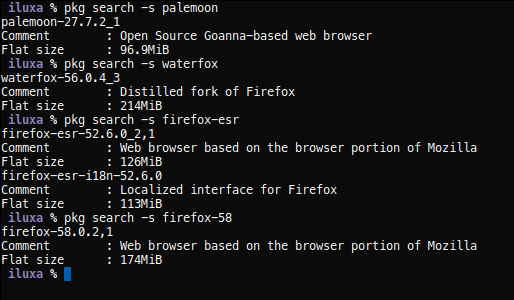 What I particularly like is that the annoyance factor of PaleMoon is much lower than FF's one. No Gtk3, no castrated menus, preferences etc. I do not feel like an gnomish idiot using it. Alright, I've built it using ports; it is really fast! And will use the recommended fixes, as mentioned above, if they are needed in the coming days and weeks of usage. Everything is good except the fact that certain banks and PayPal recently refused working with Palemoon since it's an "outdated browser". Edit: Once I set my user agent I disable Eclipsed Moon as it logs me out of the forums each time I switch to a different page if it is enabled. I do want www/palemoon to work for you. I had no problems with banks or PP using PaleMoon. I guess this depends on the location where you are. Maybe the various national Paypal dependances handle this differently, like probably every bank's staff is different. But there is another thing I would like to have and thus I ask here. One of the worst sites in this regard is Twitter. Opening a few Twitter background tabs is a surefire way to make, for example, Youtube playback jerky stop-and-go. Do you guys know of a plugin/add-on that achieves just this? NoScript is the only thing I know of that comes close. There may be something else I'm not aware of. With NoScript you can enable just the scripts actually needed for the site to work. I don't have a Twitter account but usually only a small portion are required for large sites like news outlets, etc. Sadly NoScript has no such function. Btw, I have used NoScript for a long time. But... ...my browser became slower and slower. The reason was NoScript. Its database got so big that the browser was most of the time busy with NoScript. If I see a twitter box that I think could be interesting, and allow it temporarily with NoScript, then NoScript will refresh *all* tabs which contain/embed twitter stuff. This can bog down the browser for minutes until it becomes responsive again if I have many news tabs open. For these reasons I have stopped using NoScript. I am using UBlock Origin as replacement for more than a year now. It does practically the same thing as NoScript, but automatically and without the substantial burden that NoScript puts onto the browser. uMatrix is more flexible than NoScript, has more capabilities for fine tuning. Thanks, Trihexagonal , I used User Agent Switcher add-on, and it didn't work. Then I checked the about:config settings and found that Palemoon already has predefined user-agents for certain pages, e.g. and everything works now without any user agent add-on. I use uBlock Origin, too, but only as a substitute for AdBlock. I don't have any custom rules or anything added to my whitelist, just select 3rd-party filters from the default menu. I may be missing out on a lot of its abilities. Things aren't looking too good for PaleMoon. Glad I'm not using it. Didn't know that. What a pity there has been wasted time on porting this thing. A few "pleases" would a went a long way there. I saw the exchange on the list before it was mentioned here and the guy pretty much broke in with a cease and desist like order. That doesn't fly too well in a volunteer environment. On top of that the guy is not even one of the actual owners of the trademark. It's a two way street though. If I had been the guy in charge of the port, I would talked to the owners before even acknowledging the post. Instead he almost immediately came back with a "take my ball and go home" attitude. So yeah this stuff is not immune to that kind of poor behavior. I'm using it as my only browser and will not be happy if it disappears, but I wouldn't take any guff from the palemoon people either and delete it from the ports tree as referenced if it became a problem. Does Pale Moon do anything that something like Otter doesn't? At a glance: Otter 0.9.94 RC 4 on FreeBSD does not work with java/icedtea-web. I built www/waterfox last night from ports and am using it now. One look at it and I knew how to configure it because it's just like www/firefox. I made all my essential extensions work with it, having to resort to earlier versions of some to do it (which is no different than palemooon), procured the DownloadThemAll! extension from the palemoon people and make it work, too. So for me, in this instance, www/waterfox wins hands down, www/palemoon is the loser and will contiune to be. the best, with its great firefox v25 interface and with its lightweight design. I believe that not too many people will want to use FBSD as their desktop OS. I tried Watrefox a couple of month ago and didn't like it. Also, it's more than twice as large than Palemoon. Waterfox is the same Firefox with a few things removed. was removed if it is even larger than new firefox (language packs?). waterfox is even almost twice as large than firefox-esr! I also tried to use waterfox and I don't like it too. Wow, I didn't realize that either. Maybe time to go back to firefox. All I essentially require from a browser is to render a page correctly and run the extensions I deem necessary for surfing the net and related activites. It's easy to see how I felt about palemoon before this. I do this in protest. Well, the www/waterfox /datareporting directory is only a few kb in size. I mean, if they're trying to make me go to that place where the only definition of "reason" is "causation", just don't.